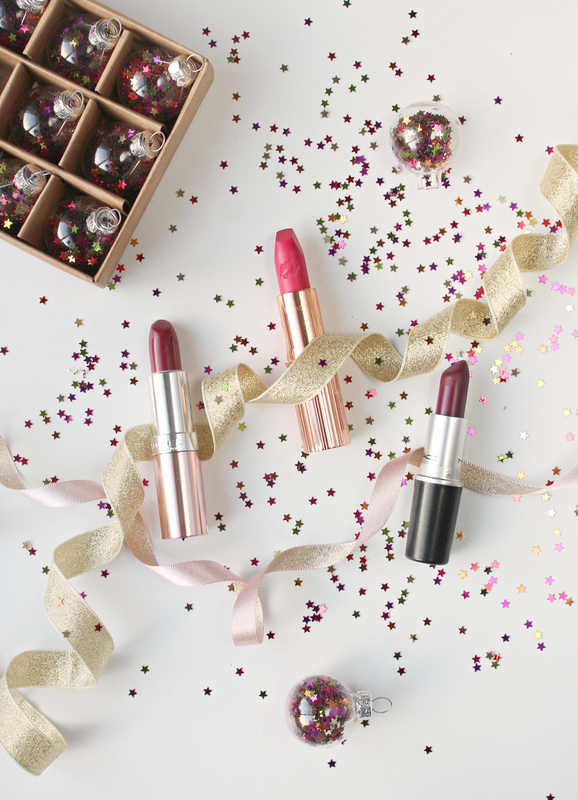 I wanted to write up a lip guide with some really bold, unique, jewel-toned shades for the festive season rather than the traditional red, so I’ve gone for a trio of vibrant colours that will fit perfectly for the holiday season and add a pop of statement to any party look. Plus, I know I’ll be sporting them a lot throughout December! The first lipstick of the three is the most affordable, and it’s for those that love a good red lip with a vintage twist. The Rimmel London Lipstick in Retro Red is the perfect 1920s deep crimson which feels very Gatsby when paired with a golden smoky eye. I love how rich the colour is and the formula of these are incredible – however, definitely pair this one with a liner as things can get a little slippy without a good base. It’s very rich on it’s own so I like to pair this with a muted blush, if much blush at all – something subtle like Tarte Exposed Blush would work really well with this shade. For something very deep, dramatic and berry toned, Mac Satin Lipstick in Rebel is a great option for something a bit more vampy for the festive season. I find this to be the perfect bold purple shade that compliments so many skintones from fair to deep. The satin formula means that it’s not too drying either which is always a bonus when you’re wearing it for long periods of time. It’s been a cult favourite for years and it definitely lives up to the hype – definitely a more wearable, yet still statement holiday lip. If you’re more into pinks, a bright pink-red like Charlotte Tilbury’s Hot Lips Lipstick in Electric Poppy would be perfect. It’s gorgeous with a peachy blush and winged liner, and it feels like a really contemporary twist on the traditional bright pink lipstick. It’s probably the most unique choice for the festive season, but it’s one that will also really step up my makeup game throughout December – and I love it! What are your lipstick favourites for this season? Previous Post Three For A Festive Glow. Next Post Three Winter Breakfast Ideas.